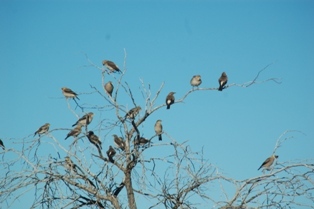 Towards the end of April my family drove to Williston in the Upper Karoo, with a few stop-overs along the way, mostly to look for the southern-most Sociable Weaver colonies, and also look for other weaver colonies although these would probably have completed breeding by now. 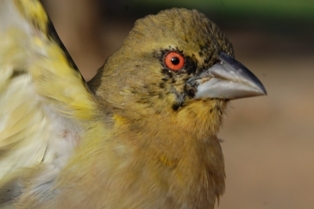 Summary: the southern-most Sociable Weaver colonies are at Damhoek farm, Northern Cape. The colony at the T junction was reported 21 years ago and is still present (-30.8145 S), although deserted in April 2011. A second colony (-30.8152 S) nearer to the farm house was active with chicks in the chambers and many juveniles with the adults. 71 adults and 74 juveniles were ringed, the furthest south ever ringed for this species. 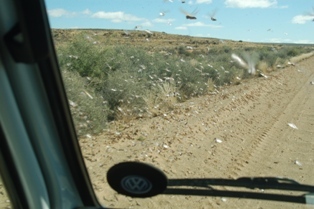 Read below for the journey to find these colonies, and many others, in the Upper Karoo. 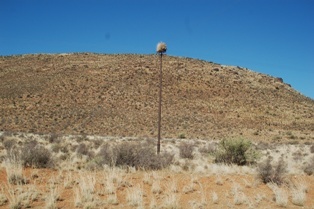 Nest sites included telephone poles, buildings, and the quiver tree Aloe dichotoma. PHOWN Virtual Museum records from this trip may be viewed here). 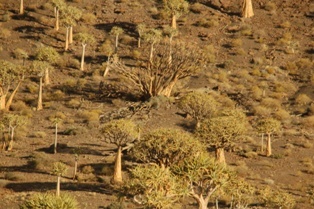 Sociable Weaver colonies from all around the edge of its distribution should be submitted to PHOWN as a baseline as this species may change its distribution with future climate changes. See current records here. A summary of all ringing records from the trip may be viewed here. Our first overnight stop was in Lamberts Bay, staying at Rosebud. The water level in Jakkalsvlei was low, but there were reeds where Cape and Southern Masked Weavers were roosting. 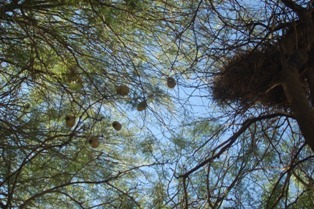 A clump of gum trees had some old Cape Weaver nests. 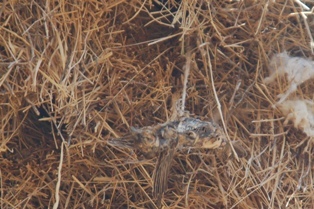 A Cape Sparrow carried a feather into one nest - these sparrows sometimes build their nests inside old weaver nests. Our second night was in Nieuwoudtville at Bokmakierie. From here we explored the amazing quiver tree forest on Gannebos farm, north of Nieuwoudtville. There are no Sociable Weavers in this area. Our next destination was Williston from where we wanted to explore the farm roads to look for the southern-most Sociable Weaver colonies. We stayed at Annie's Inn from Monday to Saturday. 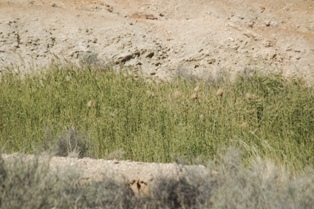 Many Southern Masked Weaver colonies were found, mostly in trees and sometimes in reeds along rivers that were dry or partially dry. These colonies were all deserted as the breeding season had passed. One colony was found at dusk and a pair of Red-headed Finches entered a nest to roost for the night (VM 768). 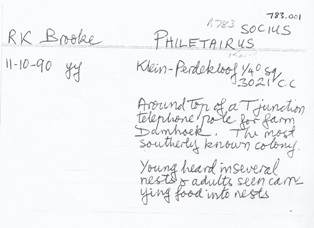 The most southerly Sociable Weaver colony known was recorded by Richard Brooke 21 years ago while atlasing for SABAP1. This same colony was found, although it was no longer active. Instead a Sociable Weaver nest mass was found a few hundred metres closer to the farm house. The Sociable Weaver nest mass closer to the farm house was active, with adults feeding chicks. A few days later we returned to do some ringing at this colony - 71 adults and 74 juveniles were ringed. 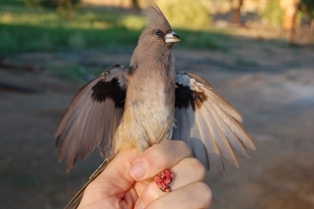 Not all birds were caught, and the colony consisted of an estimated 200 birds. 60 nest chambers were counted (VM 748). Unfortunately several birds were dead, hanging from threads that they had built into the nest. This was found subsequently at other colonies as well - no ringing has taken place here previously (SAFRING database) and the birds were caught mostly on their toes. The Williston area was searched for other colonies, and farmers were interviewed. More colonies were found, but none further south. 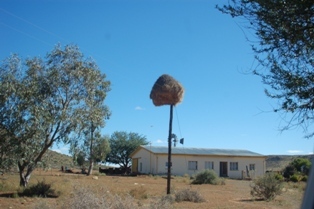 Several Sociable Weavers were found to have unique nest sites - on buildings! This has been reported once before, again by Richard Brooke (on the Brandvlei - Van Wyks Vlei road). At Beesdam farm four houses contained 1 or more nest masses. 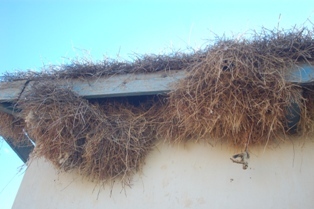 Usually the nest had a flat layer of grass on top of the roof with the main nest mass under the edge of the roof. The colonies were active with chicks being heard in the chambers. 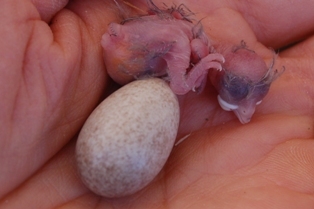 Three fully feathered chicks were ringed, and another chamber contained an egg and a newly hatched chick. Not all chambers were checked. We received a report of Sociable Weaver nests 50km SW of Williston. This would have been an extreme range extension for the species. 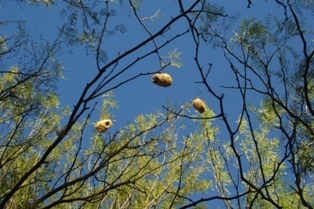 Instead, it turned out to be nests of the Wattled Starling, together with Southern Masked Weaver nests. Both species had deserted by now. The farmer noted that the starlings had bred earlier this year, and it was the first time he had them on Kapok farm in 47 years. Closer to the main road we found a flock of the starlings, feeding on locusts. Rudolf Malherbe gave permission to ring at Elim. Frans Louw gave permission to ring on Damhoek and Beesdam farms. 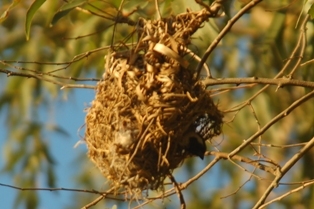 JD and Nestie Smit provided helpful information on locations of Sociable Weaver colonies. Barry and Sue provided a combi for traversing the farm roads.